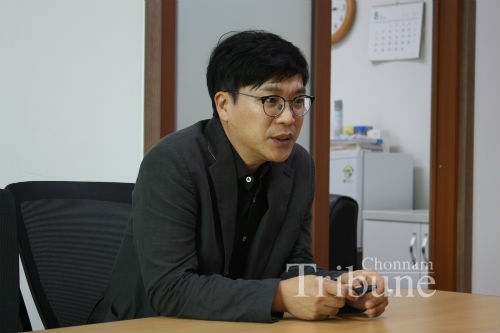 The Chonnam Tribune interviewed Moon Ki-seok, the dean of the OIA, and asked about their difficulties and their hopes. Q. What are the biggest difficulties when the OIA offers their various programs to students? A. The biggest difficulty is that they struggle to communicate with the domestic students after we invite the international students to come to Korea and send them to each college. It would be great if the foreign students were good at either Korean or English. However, many students are not good at either of those. To overcome this problem, we are going to provide Exclusive Korean Language Lectures starting from next year. Q. Foreign students are having a hard time because the CNU Portal site does not offer English language services. A. We are already well aware that many foreign students are having trouble doing assignments, paying tuition fees and registering for courses because the CNU Portal site is not providing an English language support. So we have allocated a special budget to create an English version of the CNU Portal site. Our plans are to establish the English site by winter and to be able to handle all university school affairs on the English-written site from February next year. Q. What do you want students to gain from the OIA? A. We provide services mostly to students who are in their late teenage years to those in their mid-twenties which is a critical period to start designing their lives. The experiences they get in foreign countries during this period will be precious assets that last forever. The OIA is always here to give all the students the opportunity to study abroad and to be a part of the era of globalization. So, please knock on the door of the OIA and build valuable experiences that you will never forget.